Southwest Indian art is probably the most distinctive and best-known of Native American artistic traditions. Most southwestern tribes have remained in or near their ancestral lands, suffering less interruption of their tribal traditions than the eastern tribes. Southwest Indian designs are instantly recognizable and have saturated the American mainstream, their characteristic geometric patterns visible everywhere from cowboy hat bands to Arizona's state flag; sanitized Kokopelli silhouettes festoon lawns in New Mexico the way gnomes in pointy hats do in Pennsylvania. (Kokopelli was originally a major fertility god, and authentically Indian depictions of him are often more anatomical in nature than the kind you find in Home Depot.) But Southwestern Indian art forms have not only influenced the popular culture of the region at large, they also remain as thriving, unbroken artistic traditions of the native people who first created them. The arts and crafts that Southwest Indian artists are best known for include the kachina dolls of the Hopi and sandpaintings of the Navajo; beautiful pottery, particularly by Pueblo Indian artists; woven blankets and rugs, particularly by the Navajos; and many different styles of fine basketry and silver and turquoise jewelry. You can learn more about the history of each of these native Southwestern art forms at the links above. Because Southwest Indian art in particular has become so popular, there are many forgeries and knockoffs out there--mass-produced carpets printed with Navajo-like designs, fake "kachinas" from Asian sweatshops, and so on. If you're looking for native arts and crafts that were actually made by Native Americans of the Southwest, either because it's important to you to have the real thing or because you want to support native people with your purchase, then here is our list of American Indian artists whose work is available online. If you have a website of Southwestern Native American art to add to this list, let us know. We gladly advertise any individual native artist or native-owned art store here free of charge, provided that all arts and crafts are made by tribally recognized Native Southwestern artists. Thank you for your interest in Southwest Native American art! On our main site we do our best to avoid slowing down our page loading with graphics, but this page is about art, so we'd really be remiss in not showing a few representative Southwestern art pictures. All photos are the property of their respective artists; please visit their sites to see their artwork in more depth. Sand paintings, pottery, jewelry, and other Native Southwestern gifts from a Navajo-owned craft store. Southwest silver and turquoise jewelry, pottery, and kachina dolls from Hopi and Pueblo Indian artists. Navajo rugs, Pueblo pottery, and other Native Southwestern crafts for sale online. 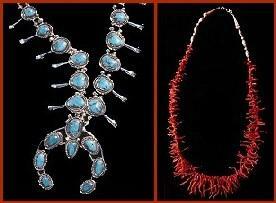 Navajo, Hopi, and Pueblo-made silver jewelry in a variety of traditional and modern Southwest Indian styles. A gorgeous selection of silver Southwest jewelry by a Taos Pueblo Indian artist. He makes custom pieces to order, too, so if you want something truly one-of-a-kind, send him a query email. Native American-owned store specializing in Native Southwestern jewelry by Navajo and Zuni artists. Contemporary Southwestern designs by a young Navajo artist using traditional silver and stone inlay techniques. Classic and contemporary Southwest jewelry designs by an award-winning Navajo silversmith. Southwestern jewelry handmade by a Laguna Pueblo artist. Southwestern rugs by an award-winning Navajo weaver. Southwest rugs and blankets by commission (email the artist if you're interested in her weaving). Contemporary Southwest Indian rugs by Navajo weaver Anita Hathale. Pueblo-owned gallery of Southwest Indian pottery by award-winning San Ildefonso and Santa Clara artists. Pueblo art gallery of Southwestern pottery and figurines. Navajo-owned store carrying Southwest Indian jewelry, sculpture, and fine crafts. Southwestern baskets, pottery, jewelry and kachinas from a Hopi-owned art store. Offering Southwestern Indian jewelry, pottery, rugs, and other arts and crafts for sale. Photographic introduction to kachina dolls and the artists who make them. Overview of Zuni fetish carvings, their forms and meaning. Photographs, history, and interviews on the art of Pueblo Indian pottery. Photographs and art history of Southwestern weaving traditions. Museum of Indian Arts and Culture: This New Mexico museum offers online exhibits on Native American art of the Southwest. Southwestern Native American Pottery: A beautiful collection of Southwest pottery photographs. Wedding Vases: Description of the Southwest Indian wedding vase tradition. Hopi Basketry Presentation: Two photo-essays on Southwestern basketweaving. Hopi Basketry: History, techniques, and photo galleries of Hopi Indian baskets from the Second and Third Mesa. About us: This website belongs to Native Languages of the Americas, an indigenous language non-profit organization dedicated to preserving and promoting endangered Native American languages. We are not artists ourselves, so if you are interested in buying some of the Southwestern artwork featured on this page, please contact the artists directly. Though we have featured only Southwest American arts and crafts identified with the name and tribal affiliation of each artist, we haven't called the tribal offices to check up on any of them, and we only know a few of them personally. This is not an exhaustive list of Native Southwest art--if you would like us to add your art site to this page, please contact us with your URL and tribal affiliation. We advertise any individual native artist or native-owned art business here free of charge. We do not link to art which is not made by tribally recognized Southwest American Indian artists. And finally, websites do expire and change hands, so use your common sense and this general rule of thumb: if the creator of each individual artwork is not identified by name and specific tribe, you are probably not looking at authentic Southwest Indian art.